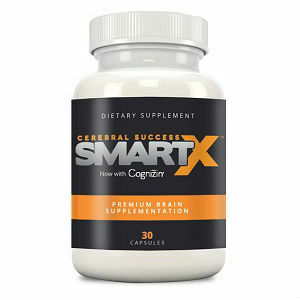 This is a review of the supplement Cerebral Success SmartX. Based on the collected information, the ingredients within this product improve focus, memory, and recall. SmartX also reduces mental fatigue, decreases anxiety, and ensures that brain functions are healthy. You will gain a deep understanding of this product as you read the following information. Huperzine A – inhibits acetylcholinesterase from damaging a vital neurotransmitter known as acetylcholine. Phosphatidylserine – crucial structural element of the cells that form the brain. Bacopin- plays a significant part in improving memory, as well as learning ability. Schisandrin A- improves mental ability. L-Tyrosine– helps to reduce physical and mental weariness. Gognizin- works by enhancing neuron communication, maintaining normal acetylcholine levels, protecting neural configurations, improving energy, enhancing brain activity, improving memory, and enhancing attention. Glucuronolactone – enhances mood and brain performance. DHA- plays a vital role in maintaining cognitive functions and brain fluidity. Caffeine and L-theanine- improves brain functions, attention, and focus while L-theanine reduces stress. B-Vitamins- play significant roles in brain cell metabolism. L-Glitamine- plays important roles in memory and learning. Consumers should take SmartX when the need to improve brainpower arises. Therefore, this product can be consumed in the morning, afternoon, before exams, and before class. Users should begin with one capsule followed by two capsules if they can manage. Users should not exceed four capsules per day or sixteen capsules per week. It is also advisable to take one or two days off for the product to work effectively. The side effects that may result from taking SmartX include headaches that result from an increase in blood flow. This product rarely causes nausea, apprehensions, reduced appetite, and depression. Pregnant women are cautioned not to use this product. One bottle of SmartX (30 capsules) costs $45 while two bottles cost $80 on the company’s website. Three bottles cost $110. Users can also subscribe for one bottle of SmartX and one bottle of Omega-3 for improved results at a combined cost of $49 per month. These packages are attractive because they allow buyers to save whenever they buy more than one bottle. The price is relatively high, which is a sign of quality. The manufacturer offers a guarantee that this product will work. The manufacturer also offers a 30-day 100 percent satisfaction guarantee in case the product fails to satisfy the consumer. This guarantee gives the impression that SmartX is a high-quality product. SmartX is a suitable product for people who wish to enhance focus, improve memory, enhance recall, decrease mental fatigue, decrease anxiety, and improve brain functions. One advantage of this product is that it uses a combination of known ingredients. It also offers a satisfaction guarantee, which shows that it is a high-quality product. However, the price seems to be a bit high. Additionally, this product is not suitable for vegetarians because the capsules consist animal byproducts. Henry Costa	reviewed Cerebral Success SmartX	on June 14th	 and gave it a rating of 3.